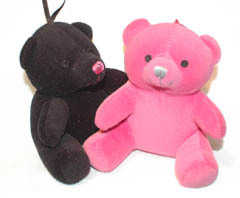 These Little Love Bears used to live at Victoria's Secret, and now they can come live with you. Each bear measures 3.5 inches by 3.5 inches and just begs to be squeezed. They sell for $5.00 each, but your can buy a pair of them (one pink and one black) for $8.50.